This is an extension to perform routine calculations when converting from scene (screen) coordinates to coordinates in an environment with isometric projection. It allows for quick conversion back and forth between both coordinate systems. 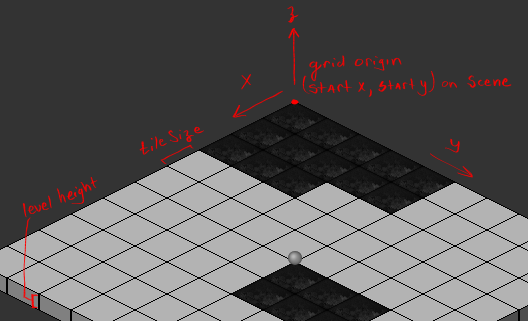 It also supports isometric tiles, rows and columns, and custom placement of the environment's origin in the scene. The full documentation is on my site: http://www.anorthogonaluniverse.com/public-code/isometric.php, and includes a full function reference. Use this section to record updates and changes to the extension. This looks awesome. Thank you for your work. I ran the demonstration you have in your profile/arcade and I suggest you put that in the post as well so that we can see what we can make with this cool extension. Right now I have a lot on my plate, but maybe a future Ludum Dare would be perfect to play with this! Thanks for taking a look! I added a link to the arcade game, although it is using an older version of the extension that had a hard-coded origin. Released an update to this toolset. Correction has been applied to the download on my site. Thank you so much, @merrak. This useful extension really facilitates the work. can you explain in more detail how to use this extension? One approach to making an isometric game with Stencyl is to double up on the number of actors. Let's take the player for example. The player is represented by two actors: a "physics" actor and an "image" actor. The physics actor is invisible and moves around in the scene. The image actor is drawn at a position determined by where the physics actor is. The primary function of this extension is to do the math needed to convert between the two coordinate systems. You're still on your own to set up rendering, computing the drawing order, etc. The example project should illustrate one way to do that, though. There are other ways, too. I wrote about a couple other approaches I experimented with in the journals forum.